After successfully launching as a Kickstarter project last May, this smartwatch finally becomes widely available via Best Buy, Pebble.com, and Target. Pebble Time started as a Kickstarter project and, once it became a successful one, shipments commenced last May. A few weeks ago, this smartwatch/fitness tracker became available for pre-order on Best Buy. 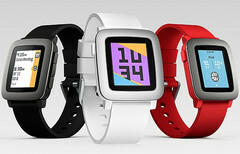 Now, Pebble Time is finally ready to reach a wider audience via Best Buy, Pebble.com, and also from Target. Although Pebble Time only reached its Kickstarter backers so far, this smart wearable already received a first firmware update. The update took place last week, pushing the firmware version up to 3.1. Pebble Time is water-resistant, comes with an always-on color E-Paper display properly protected by a durable glass lens and features an ergonomic design. It can last up to 7 days on a single charge and can interact with apps like Jawbone, Runkeeper, Fitocracy, or Misfit to track various health and fitness parameters, being fully compatible with both iPhone and Android handsets. According to the official blog post on this matter, Pebble Time is already available via Pebble.com worldwide and Best Buy (online and in-store, only in the US). Target will also sell this wearable in stores and online, but starting the week of August 17. Pebble Time can be purchased in black, white, or red.